Almost time for Update 2.8: Spoils of War to hit the live servers. How have you been getting ready for the new update or spending your time in-game? I have been playing several hours on a few of my multitude of alts. One thing I did get checked off the SWTOR to-do list, was acquiring HK-51. Yes, it’s true I’m a bit late on getting this companion, but that doesn’t change the fun my nephew and I had doing this quest. Speaking of the nephews, it was great getting to group up with them the past few days. We have also got their older sister to create an account. I will be missing them while they are away the next few weeks. 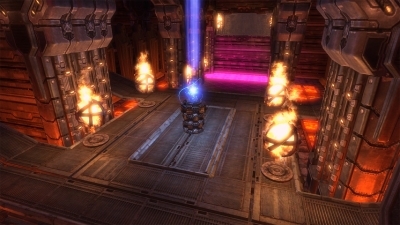 You can almost hear Baron Deathmark bellowing out instructions to players getting ready to play the Dread Armory Huttball map located on Oricon. Okay, before everyone “jumps the gun,” this new map is the vision of SWTOR forum user, idnewton. I found this fan suggestion located in the Fan Art forum on the SWTOR website. The look of the map immediately places you in the Oricon setting. The artist really captures the feel and look of Oricon and the Dread Masters. Besides the setting and look of the map, idnewton also describes some possible ancient traps located on the map if it was created. Trap mechanics like Force levitation and of course plenty of fire/lava since Oricon has lots of the hot stuff flowing around. What do you think of this forum user’s Huttball map? Do you have an idea for a new Huttball map or new Warzone? Why not share in our comment section below or post it to the SWTOR forums? On the SWTOR reddit, WhoIsHarlequin asked “What is the best way to get social points?” I thought this was a good question. It seems that this is an obvious clear answer, players need to participate in-game with other players. However, there are specific activities to help players gain those levels in their social rating. Many of those commenting on the reddit thread had a lot of good tips. Running Flashpoints that have multiple conversations tend to offer several social points. When you run those Flashpoints, make sure to have four players to gain the max social points in those conversations. Another thing I have noticed, if you are grouped and complete planet quests, heroics, etc. you gain social points for doing the extra bonus missions. Have you come across some helpful tips to gain social points? We would love to hear your suggestion. Please leave us your suggestions in the comment section below. In 2.8, we are making some changes to how the spam filter handles /say messages to the opposite faction, so this should clear up the issues you’re seeing. If you still continue to have problems after 2.8, please let me know so I can pass it along. Personally, I’m glad to see this being addressed by BioWare. There has been increasing levels of spam showing up in General Chat on Fleets and the above mentioned /say messages. Anything that helps cut down the amount of spam in any game is a great thing. We’ll take a look into this to make sure everything is working properly. Thanks! Hopefully this is an easy fix for BioWare to apply to the game. It is never good when a mechanic that is needed to summon a World Boss fails to work. If you come across a similar bug that is hampering your gameplay, be sure to report this to BioWare in-game and also post to the forums. When you create an in-game ticket, there will be some possible solutions for the type of bug you described. It might provide the answer you need. Bugs are not fun, however, if we do our part to report them it only aids to speed up the process. “So, what does a Sith do for fun?” Youtube user, TheKythia attempts to answer that very question with the video they have posted. The song Protectors of the Earth acts as a backdrop and powerful foundation to support the artist’s vision for this video. 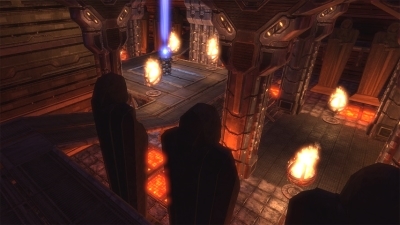 Utilizing numerous animated cutscenes and camera perspectives from the player’s point of view, helps showcase the journey of this particular character playing out the Sith Inquisitor storyline. This is just one of many videos that follow the Saga of Jade. It is important to note that some small spoilers might be revealed while watching this video.